The road to Hoshangabad began at the break of dawn, yet the crowded streets suggested a later time of day. Our cab darted and weaved through seas of people though there was seemingly nowhere to go, as most shops had yet to open. I was glad to leave the bustle of the city for the wider, and comparatively bare streets of the highway. My relief soon gave way to fear, however, as our driver was determined to play chicken with oncoming traffic like a schoolboy from Grease. I’ve learned in India that it does little to worry, so I turned my attention to the enthralling sights just out my open window. As we drove, I wove my fingers through the air, bouncing them to the beat of the Bollywood music playing from the car’s radio until a panicked look from the cab driver reminded me to keep clear of the window. As if to remind me yet again of the perils of not remaining in the confines of the secure car, we whizzed past a small herd of cattle making their way down the highway without a care in the world. Hemraj’s family in the village of Padav. The four hour journey went on similarly as we passed goats, buffalo, cattle, monkeys, and several caravans of camels draped in colorful cloths and even more colorful people. Stopping only for the occasional chai, we arrived in a small village that seemed to have more livestock than people. Though honking is as common in India as the chirps of birds or the hum of insects, transport in the village was mainly comprised of bicycles and motorbikes and our loud car honks brought eyes from every direction. The gazes of the villagers were not unkind, merely curious and excited as our car struggled over the narrow dirt roads. Our arrival at the home of Hemraj, Under the Mango Tree’s Master Trainer in beekeeping for the Hoshangabad area, was well met as his family gathered round to greet us. His home was painted entirely blue inside and the shade reminded me of the fabled homes in Santorini, Greece or the Blue City of Morocco; as we sat on woven beds, his children and other family members studied us from the corner of the room. Hemraj proudly displays his bag of pollen from the Himalayas. Though my Hindi is limited, it was easy to understand when Hemraj spoke of his successes in beekeeping as his eyes sparkled and he seemed to sit taller in a more comfortable and commanding position. He was eager to show us a bag of pollen collected from a region near the Himalayan Mountains, which he intended to feed his bees with. He spoke of his bees much like a father would speak of the accomplishments of his own children. After my colleagues had collected the necessary information and provided new resources for the upkeep of the bees (training videos, a cellphone for ease of contact, pollen for the bees, etc. ), we made our way over to Hemraj’s bee boxes which were kept just a few hundred feet from the house. 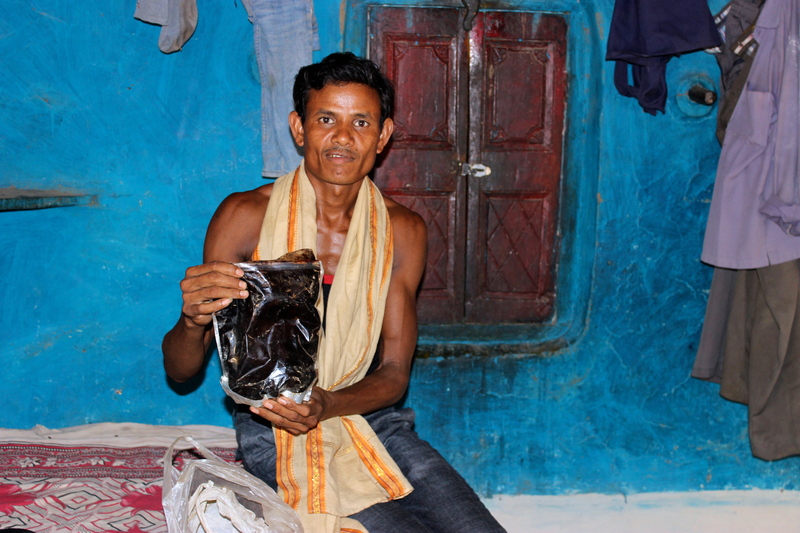 Of the farmers Under the Mango Tree supports in Madhya Pradesh, Hemraj has the most bee boxes. He currently has five, though he recently sold two boxes to other farmers and has located a natural colony near his home. Hemraj’s bee boxes were afforded every care and protection from the gabled canopy that covered each box to the individual thatched roofs, which provided shade from the sweltering heat. As he removed the layers of protection, bees began to venture out through the slit in the box that was left uncovered by the mud used to keep them cool. Hemraj worked with skilled and confident fingers as he pulled out sheets from the box to reveal the sticky honeycomb within. The bees seemed unperturbed, no doubt due to the artful manner in which Hemraj handled them. 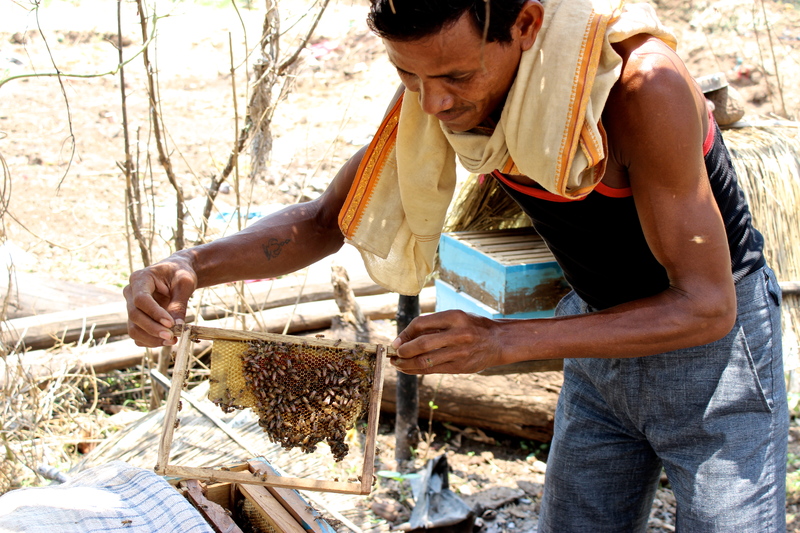 We left Hemraj’s bees to visit those of another farmer whom Hemraj often assists in his beekeeping. As I learned more and more about Hemraj, it became clear that though he has only been keeping bees for a few short years, the results have been more than increased yields in his other crops or honey for the market; he is depended on and sought after for advice and as such has become a more prominent member of his community. 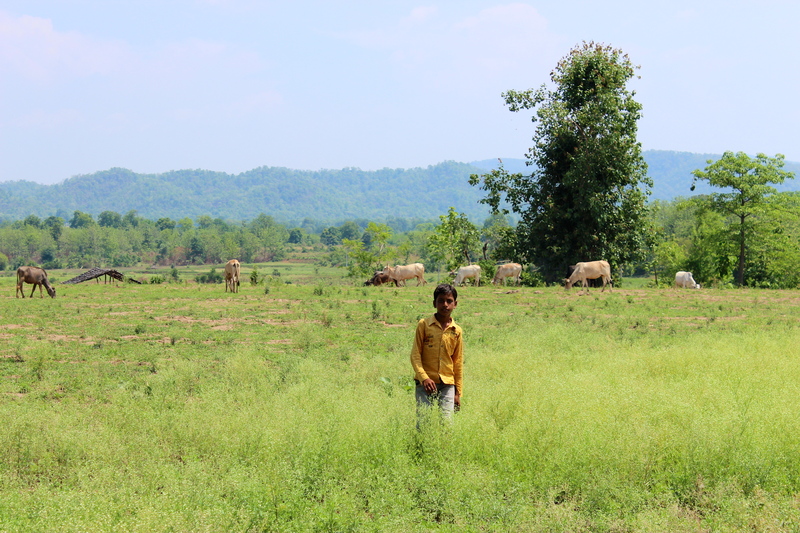 Before leaving to visit his neighbor’s bee box, Hemraj changed into a clean shirt, as he would leave from our next destination to serve as a priest in a nearby wedding. While Hemraj and others inspected the status of the final bee box, I attempted to speak with children in the nearby field. Our language was limited, but it did not stop us from understanding one another as one boy brought me leaves to feed the goats I’d been trying to pet or as I signaled that I wanted to take a picture of them in the field. . . . . . . . . . . . . . . . . . . . . . . . . . . . . . . Boy plays in field by bee box. We left the way we came, though our path was blocked by some skittish cows that had stopped short on account of a massive, dead python made bigger due to some recent meal it had consumed. We forged our own path through the brush, avoiding the traffic jam caused by the behemoth snake and dropped Hemraj and his cousin off to preside over a wedding. The journey home was as lush and exhilarating as the road to Hoshangabad had been filled with sightings of Komodo Dragons and, of course, more monkeys. 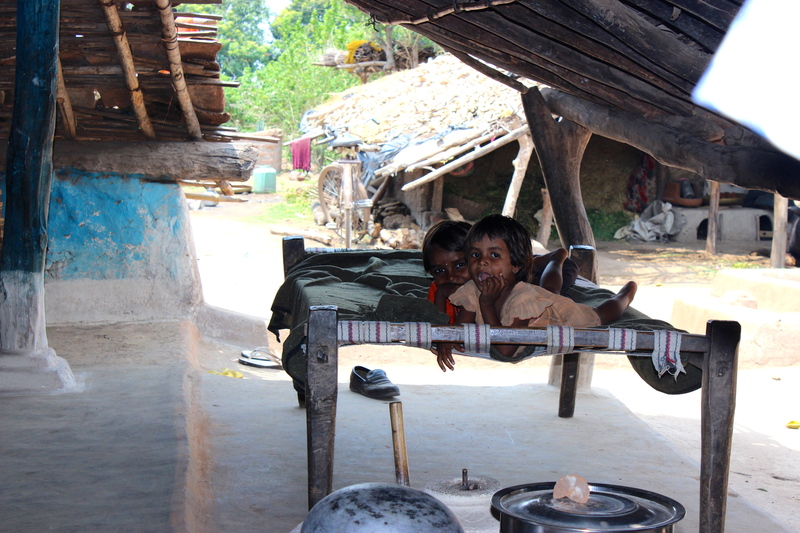 Though our time in Hoshangabad was far shorter than the trip there, the experience was one which I will never forget.